The more than 70 of you who attended the 3rd and last public meeting were excited by the completed preferred site plan (details) presented by Site Workshop. I thought you’d like it! Site Workshop does wonderful work and here at Magnolia Manor Park, they did a great master plan, using all the Parks potential spaces to great advantage. The plan opens the park up to its full usable space by getting the reservoir area re-fenced , keeping an appealing front porch landscaped lawn as the welcome mat for the park, adding the view vista plazas of the Cascades and Mount Baker, dedicating well-planned space to Magnolia’s first 50 P-patches on the sunny south side, and designing Magnolia’s First Off Leash Area tucked in and buffered by landscaping on the north with a chuck it space, a small dog area and room for dogs to play. View plazas, informal picnic/play areas, the ADA assessable paths that flows through/around the spaces and connects the park in a two mile loop of other near-by parks, and an orchard area where families and folks can adopt their own gravenstein apple, or Italian plum tree. The most amazing thing though was how people accepted enthusiastically the challenges of getting it built and building it right!. There is lots of planning to still be done, tons of fundraising to do, and many, many volunteers and volunteer hours will be needed to make our wonderful design a reality. Over $1,500 dollars were donated and pledges are still in the mail. Many of you volunteered on the spot to help with funding and finishing an element of the park that interests you, be it the OLA, P-Patch, or general Park like removing fences. We will be in touch soon with each of you…if you don’t hear from us…don’t be shy, call us at 206-284-2430 or email us from here. The new steering committee is dedicated to this as well. The web site will soon have a pledge form on line and a pay-pal account for easy donating. We will hopefully be setting up a texting account so when you play with your dog in the park, take a walk there or teach your child to ride a bike on the asphalt paths, or mark your monthly calendar donate to Manor Park – you can text a donation from your cell phone! The funding plan for the OLA and general park fund is being updated and finalized and will be on the web-site in the next 2 weeks-read it and send us your ideas. Volunteer for event planning and help out at our events. There will be an events calendar and places to volunteer up soon on the this web page. Visit often and volunteer as much as you can as we travel down the path to a park together. The Friends of Manor Park Steering Committee meets the June 14th, Tuesday at 7pm, at the Q Café. Join us as we make plans to make Magnolia Manor Park a reality. Wednesday’s meeting gave neighbors the opportunity to see the preferred design for the park, which was overwhelmingly well received. Site Workshop did a tremendous job of enabling neighbors to visualize what the park will eventually become. (Update: click here for details and schematics.) It was first explained how we arrived at the final design, having received feedback from the community and aligning this feedback with site constraints. Then Site verbally walked through the different elements of the park which invites people seeking open space, views, off leash areas, and p-patches into the park. It will also create a link to other nearby parks and green spaces. The journey to creating this park has just begun, so it’s a great time to become involved. To create the best off leash area, which will be the size to accomodate a “chuck-it” area and small dog area, we will need to raise additional funds and get Parks to extend deadlines for its implementation. Wednesday’s meeting affirmed that the community is ready to take on that challenge. Fundraising will continue to reconfigure fencing to establish a p-patch and allow better access to the park from the east. Thank you to all who participated in Wednesday’s meeting – the best attended so far. It’s encouraging to see neighbors willing to work not only for their own interests but for each other’s as well. That was said time and time again. Thank you to those who have followed and participated throughout the design process. And a huge thank you to Site Workshop’s Jim Keller (a neighbor of the park himself) and Clayton Beaudoin. They generously gave of their time with such grace. Their facilitation skills truly matched their great design skills. How fortunate we were to have them on board. As we near the exciting conclusion of the first public process and grant for making Magnolia Manor Park, it is my first and greatest hope that you come to the final meeting June 8th (see info below in Nancy’s message), and see for yourself the Preferred Site Plan. I think you will like it! I am excited by what the community has asked for and how Site Workshop has worked creatively to give us a fun, thoughtful park plan that incorporates Magnolia’s first OLA and P-patches, and so much more! I am also so thankful for the work of The Sustainable Magnolia’s Steering Committee to get us where we are today! You can make a difference…join us at the public meeting June 8th, join us as a member of Friends of Magnolia Manor Park, join us this summer for events like a birdhouse building workshop and learning about our native birds, the chili cook-off or participate in COLA’s Dogoween at Manor in October Park, bring your dog in costume and compete for prizes. Watch the park signs and this blog for work parties, family fun and fund-raising news. One of our first priorities is to get the fences re-configured so that an additional 1 1/2+ acres can be used as park. We are asking for community support in the form of letters, ideas, and funds to accomplish this. Contact us via this website if you want to help with this important step. 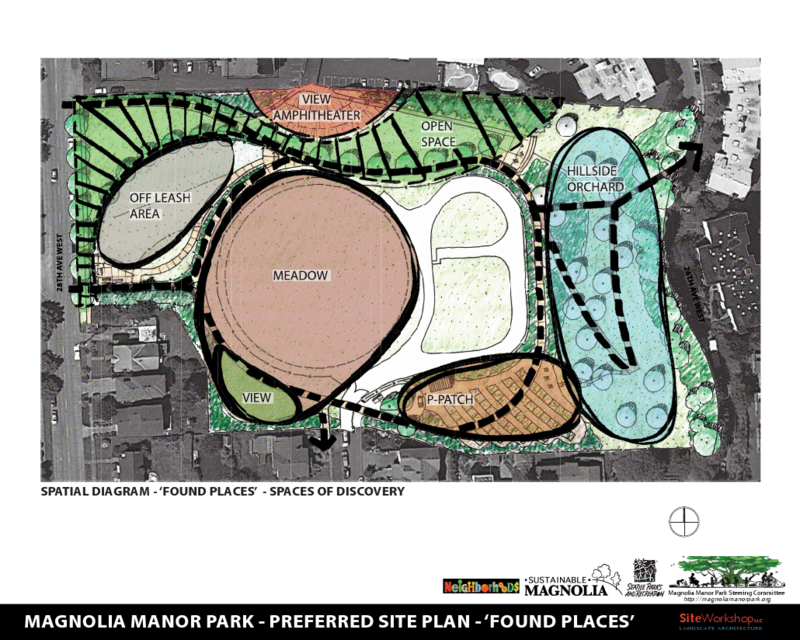 So, as we finish the first phase of making Magnolia Manor Park…keep on following with us on the path to our Park! See you at the meeting! The preferred site plan for Magnolia Manor Park will be presented at public meeting #3, to be held on Wednesday, June 8th from 7-9pm at the Magnolia Presbyterian Church. The community is urged to attend and provide feedback. The steering committee is pleased with the design as it seems to best incorporate elements the community most wanted in this heavily constrained, small park. This high-level schematic design will usher in the next phase of construction documents, costing and permitting for future implementation. This is an exciting time to be a part of this park’s transformation, so please mark your calendars and plan to attend. Many thanks go out to the community for providing feedback and participating in the process so far. I hope there is a true sense that your voice was heard. As one commenter put it, this park simply cannot be all things to all people, but it can be some things to all people. That’s still a tall order. To all who came to the meetings and listened to neighbors’ concerns with true interest, who considered other people’s perspectives so thoughtfully, to all who set aside the time in today’s busy world to be a part of this process, I thank you. Many simply couldn’t come to the meetings and yet took the time to provide such thoughtful feedback. Thank you. This community certainly lifted this process to a higher plane.